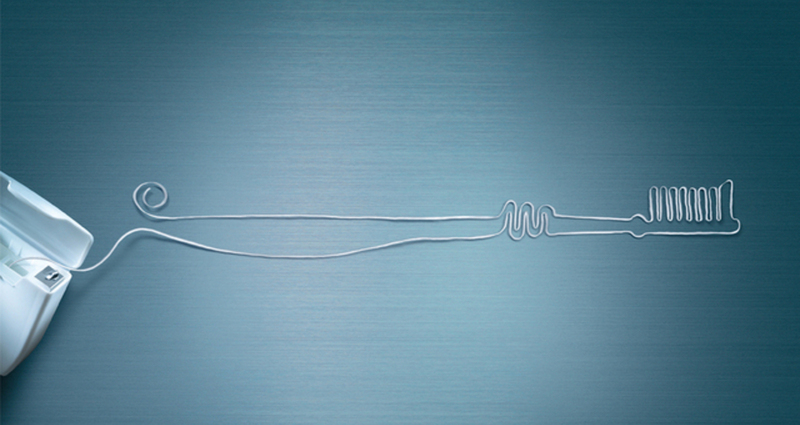 Dental Floss / GlaxoSmithKline Ltd.
To show the benefit of using this flexible toothbrush, a print ad was made with the toothbrush illustrated using dental floss. The Aquafresh Flex Top has the flexibility to clean any gaps in your teeth –just like using dental floss. To clean food debris and plaque from between your teeth, dental floss should be used. But now, brushing on its own should do the trick. That’s if you used Aquafresh Flex Top Toothbrush. Our aim, therefore, was to find a creative way to show that by using Aquafresh Flex Top Toothbrush, you can reach all gaps in your teeth.